The Babyzen Yoyo+ Stroller is an awesome stroller for those who are willing to spend da little more money for not just their child’s comfort but for themselves as well. The stroller comes in a bundle with great attachments and features that aid its owner in the ease of use and maneuverability. The Babyzen Yoyo Plus is a great stroller for parents who want to have an everyday, travel and standard stroller for their child. This stroller is extremely versatile for a lightweight stroller giving the user access to a travel system and bassinet with the willingness to spend a little extra money. The Babyzen Yoyo Plus enables the user to go to places with ease! 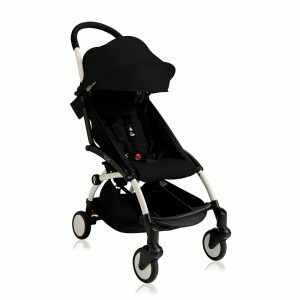 It is also one of our recommended lightweight strollers! The Babyzen yoyo plus is a durable stroller which is crafted with care and durable materials. The wheels are made out of durable rubber, many lightweight stroller’s wheels are made from plastic and this causes the wheels to deteriorate quickly. BABYZEN YOYO+, in the color of black. It has a sleek and light finish which will definitely draw the eyes of the people around. This is not the lightest stroller on the market. Coming in at 28.5 lbs, it is a heavy stroller. However, when compared to other joggers, it ranks about average. But, with all the included features and sturdy build, the weight feels justified. On the rear wheels there is a single red break switch on the right hand side that will cause both rear end wheels to lock up. This break pedal is also easy to release and is sandal friendly. There are no front brakes. The Babyzen Yoyo is a compact stroller that can fit through any standard door. Its unfolded measurements are 20.5 x 7.1 x 17.3 inches. This is smaller than most standard strollers. This stroller is easy to use, all its features can be used with a click of a button or a slight adjustment. Reclining is easy as well and it can go down to almost 60 degrees. The Babyzen Yoyo Plus has one of the best folds in the category of lightweight strollers. It almost folds in a rectangular shape with the measurements of 20″ W x 17″ L x 7″H. The handlebars of the Babyzen Yoyo are padded with foam to make the ride more comfortable for the user. However the handlebar is not adjustable for the user is stuck with the grip at the given height. The Babyzen Yoyo Plus has great maneuverability. The front wheels have the ability to rotate 360 degrees and also lock in the front if the user needs to go over terrain such as grass. The suspension also helps the user when there are any humps or uneven grounding. This stroller does have suspension but the wheels are not made for rough terrain. These accessories are to help increase the adaptability and child comfort. However they are not necessarily needed all the time. Note that these are not included in the initial purchase of the stroller. The Babyzen Yoyo Plus does not take a long time to assemble. It comes mostly read and the wheels are already attached. The only thing the user needs to do is attach the seat and seat fabric to the frame of the Babyzen Yoyo+. All parts on the stroller are detachable, such as the seat, wheels, canopy, storage space. It is not recommended to put the parts in the washing machine. For the best result all parts should be hand washed. This is a lightweight stroller that does contain a larger storage space. It has a mesh pocket behind the seat which allows for small storage such as a phone, wallet or keys. There is a storage space below the seat which can store a diaper bag and a smaller backpack. The Babyzen Yoyo Plus is one of a handful of lightweight strollers that has a deep recline. This allows children to have a decent nap. It is not recommended to use these strollers for new borns’, but it is possible with the Babyzen Yoyo plus for as along as there is extra padding when the seat is facing forward. The Babyzen is also car seat compatible with the adapters, and also there is a bassinet feature available. So the baby will have the comfort it needs within their reach. The only downside is that the foot fest is able to adjust, so the taller children may not be able to position their feet comfortably. The five point harness also have three adjustable positions, so the stroller can easily fit an older child. The stroller is able to hold up to 50 lbs. 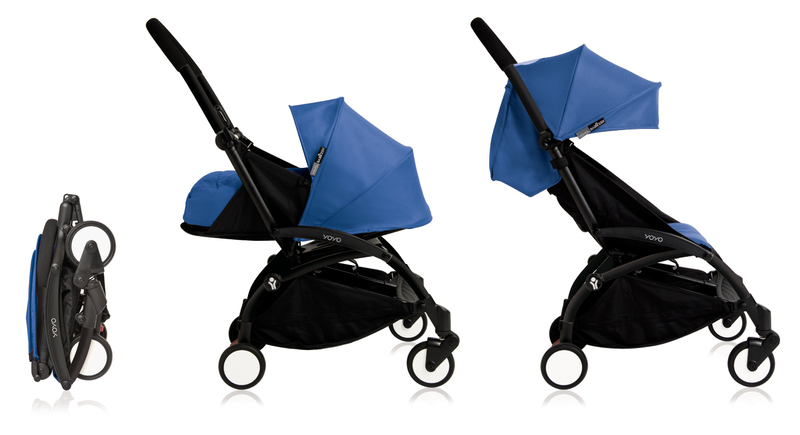 The Sun Canopy is also a great feature on this stroller since it features a peekaboo window. But on top of that it can be expanded or retracted to the owners needs and is water proof. It can also be It is also detachable so users do not always need to have it on at all times. The stroller also come with a rain cover just in case nature does not agree, so the baby will be well protected with the cover and the sun canopy. The Babyzen Yoyo Ploys also has suspension on all four wheels. This allows for a smoother ride even on rougher roads. But it should be noted that it should not be used on rough terrain, such as nature walks or jogging.